«©NCSX» Baby Cinnamoroll is a cuddly pup with floppy ears which are expansive enough to impart the power of flight. 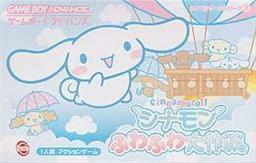 By flapping its ears, Cinnamoroll soars through the heavens like a marshmallow angel. In Cinn's third Gameboy outing, the pup floats like a butterfly in order to grab pastries that have been strewn through vertically and horizontally scrolling levels. To fly upwards, press up on the D-pad and to dive bomb on a pastry, tap the D-pad downwards. During the flight scenes, neither A nor B buttons are used. In addition to flight, Cinnamoroll may play 5 mini-games suitable for children. View the back cover and screenshots on the main NCSX site. * In the intro to the game, Cafe Cinnamon is the place to be and Cinnamon hangs out with a pack of its dog friends. After starting the game, Cinnamon is lounging at a table enjoying a drink when his friends land in a big hot air balloon. * The game begins with a view of a map where only the upper left corner is viewed while the other areas are covered by clouds. Cinnamon sits on a chair next to an umbrella-topped table in the lower right corner of the screen. Cinnamon's ears flop by themselves and appear to have a life of their own. Point the feather cursor over the building in the upper left corner and Hit A to start the action. * Cinnamon drifts downwards slowly. Move him around to grab cakes and pastries while avoiding toy soldiers and birds which don't actively chase Cinnamon but move to and fro in a mindless march. To fly upwards, press the D-pad up and Cinnamon courses up. To dive, hit the D-pad down and down Cinnamon goes. After grabbing the last cake at the bottom of the screen, a tally screen appears which lists which cakes were grabbed along with your score. A bonus pancake with a pat of butter on top is the bonus prize. * In the next level, Cinnamon makes its way upwards while collecting cakes once again. The bird obstacles are joined by butterflies but the toy soldiers are gone. In the second level, switch mechanisms may be hit to open doors and reveal bonuses.